Whether you’re trying to stay cool in the summer heat or you’re trying to keep your home warm during the winter, your heating and air conditioning systems are critical to your comfort. You need an HVAC contractor who is just as concerned about your home’s comfort as you are. That’s why Quality Air Heating and Air Conditioning is proud to offer comprehensive heating and air conditioning service in Pataskala, OH. Whether you need repairs for your furnace or central AC or you’re looking to have a new heat pump or ductless mini split system installed, just give us a call. We offer 24/7 emergency heating and air conditioning repair in Pataskala, OH as well so call us anytime. Homeowners throughout the Buckeye State rely on their heating systems heavily during the winter in order to stay warm. Here at Quality Air Heating and Air Conditioning, we offer a full range of heating service in Pataskala, OH including installation, repair, maintenance, and replacement for many different kinds of heating systems including gas, electric, and propane furnaces. For new installation work, we’ll talk with you about the size of your home and your energy usage goals so that you can recommend a terrific heater that fits your budget and your home’s needs. Don’t let heating issues keep you from enjoying the comforts of your home. If your heater is blowing cool air or if it is making any unusual noises, Quality Air Heating and Air Conditioning is here with high quality heating repair in Pataskala, OH. We respond quickly to your call and we will do our best to find the problem quickly and take care of it so that your home can get back to normal as fast as possible. Are you moving into a new home that needs a new heating system? Are your ready to replace your current heater because it’s old or starting to break down more frequently? Quality Air Heating and Air Conditioning offers fast, professional and top quality heating installation in Pataskala, OH. Our expert technicians will help you through the entire process to find a new system that matches your home’s needs as well as your budget. Professional installation is probably one of the best investments you can make in your home’s efficiency and comfort so call us today. If you need any kind of air conditioning service in Pataskala, OH it can be hard to find a good contractor. Here at Quality Air Heating and Air Conditioning, we treat all of our customers like our family members or friend. We value our relationship and our expert technicians have the skill and training to deliver high quality service on every job. Whether you need a new AC installed or you need repairs for your existing system, call Quality Air Heating and Air Conditioning for all your air conditioning service in Pataskala, OH. If your air conditioning system is leaking water or if it is making an unusual noise, it likely isn’t cooling effectively. Quality Air Heating and Air Conditioning is here with 24/7 air conditioning repair in Pataskala, OH. Our highly trained technicians can work on all types of AC units including ductless mini splits and geothermal systems. We can fix any problem that you might be having so call us as soon as you notice any problems. When a new air conditioning system gets installed, there are many different components that need to be calibrated and connected properly in order for the system to work well. Don’t let a non-professional install your new air conditioning system, as this could cause it to operate inefficiently or improperly in the future. Quality Air Heating and Air Conditioning offers complete air conditioning installation in Pataskala, OH for all types of systems. Call Quality Air Heating and Air Conditioning today and one of our Pataskala, OH air conditioning installation experts can talk with you about the entire installation process. Many homeowners don’t understand the huge value that maintenance has for their air conditioning systems. We here at Quality Air Heating and Air Conditioning offer total air conditioning maintenance in Pataskala, OH for homes of all sizes and all types of AC systems. Call us today to talk with one of our experts about how maintenance could reduce repair, increase the efficiency of your system and extend its life. Plus our maintenance program members get reduced pricing, priority service, extended warranties and other perks. When you need to replace your air conditioning system, it can be overwhelming to have to look for a new system in the sea of options on the market. But when you call Quality Air Heating and Air Conditioning for air conditioning replacement in Pataskala, OH we’ll help you navigate the air conditioning market and make sure that you find a terrific new air conditioning unit that matches your home’s size and your budget as well. Call us today. Are you looking for a new commercial HVAC system for your business? Quality Air Heating and Air Conditioning offers all the commercial HVAC service in Pataskala, OH that you could need. From installation to maintenance and repair, our experts can handle any job that you have, so call us today. When your HVAC systems breaks down, it can put a serious dent in your business. 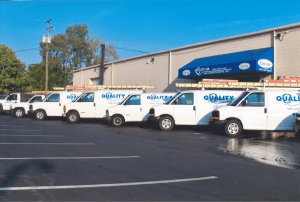 Call Quality Air Heating and Air Conditioning for commercial HVAC repair in Pataskala, OH. If your system is making a strange noise, producing an unpleasant odor or not delivering enough cooling or heating, call us immediately. Waiting will only give the problem more time to expand and grow. We’re available 24/7 for emergency commercial HVAC maintenance in Pataskala, OH, so call us anytime. Finding a new heating and air conditioning system for your business can be a hard decision to make on your own. If you’re not sure which type or size of heater or AC system to get, all you have to do is call Quality Air Heating and Air Conditioning. Our commercial HVAC installation experts can help you through the whole process. We can recommend a system for your business that fits your needs and your wallet. From there, our expert technicians can install your system quickly so that it works well for many years to come. Taking advantage of our maintenance program is probably one of the best things that you can do for your HVAC system’s efficiency and life expectancy. Without it, your HVAC will develop many small, unnoticeable problems that will eventually balloon into larger repairs. Call Quality Air Heating and Air Conditioning for commercial HVAC maintenance in Pataskala, OH, and start making an investment in your business’ future. Our maintenance program members get access to reduced pricing, extended warranties and many other perks. Are you looking for an alternative to traditional heating and cooling systems like furnaces and central AC? Then a heat pump could be a good choice. Quality Air Heating and Air Conditioning offers total heat pump service in Pataskala, OH and we can help with any type of service that you need. Already have a heat pump but it’s not working well? We offer 24/7 heat pump repair in Pataskala, OH so call us anytime that you need service. If your furnace is making any unusual noises or if it isn’t producing enough heat, you should call Quality Air Heating and Air Conditioning for furnace repair in Pataskala, OH. Problems with your furnace could cause more than just comfort issues: it could be a safety concern. We also offer a full range of additional furnace service in Pataskala, OH for all types, including electric, propane, and gas.